“When I was small,” young Lupe Gómez says, “Mom helped me do everything. Now that I’m older, I have to help my mom because I can speak English, and she can’t.” At school, Lupe speaks English. At home, she speaks Spanish with her mom. And outside the home, sometimes she speaks for her mom. Unlike many picture books about immigration, I Speak English for My Mom is anything but a deficit model of an immigrant family. Before Lupe’s papa died, her mom promised him that she and her young daughter would come to the US where opportunities would be better for them. Lupe has heard this story many times: She and her mom will work hard and she will go to college and get a good job when she grows up. Although they have to scrape by economically, Mom is far from helpless. She’s raising her daughter in a mixed community where the adults speak Spanish with each other and their bilingual kids code-switch, she works full-time in a garment factory where everyone speaks Spanish, she shops mostly at the local frutería, and cashes her paycheck at the currency exchange next to the factory. Usually, the only times she enlists her daughter to speak for her are at the pharmacy, at the clinic, and at parent-teacher conferences. When Mom takes me to the clinic for my checkup, the doctor speaks English. I tell Mom what he says. Once I played a trick on her. “What did the doctor say?” Mom asked. “He said I should eat lots of candy and ice cream.” Mom laughed. She knew I was fooling her. As do many youngsters with this kind of responsibility, Lupe sometimes feels put-upon; when her mom needs her, however, she’s there. But when the factory where mom works cuts everyone’s pay because “business is not good,” Mom realizes that she needs to look for better prospects. And she knows she will have to learn English to work downtown. After some amount of worry, Mom and her friend, Mrs. Cruz, decide to enroll together in free English classes offered at the local high school. “Very good,” I tell her. “Thank you very much,” she says. Then we go back to speaking Spanish. “It takes me a long time to learn a new language,” Mom says. “I think maybe I will miss it,” I tell her. Friedman’s detailed pencil drawings are emotionally honest, warm and inviting. Most of them depict mother and daughter together—at the pharmacy, at the clinic, at school, and in the kitchen, counting Mom’s meager earnings. And on the cover, rendered in watercolors on a subdued palette, mother and daughter sit on a couch together, holding hands and smiling at each other. What’s not generally illustrated in picture books with this kind of theme is here: older and newer houses on a tree-lined street, a tiled kitchen with a potted plant, patterned wallpaper, curtains on the window, and a vase of flowers on the dresser next to a family photo of mamá, papá, and baby Lupe in Mexico. Mom tucks me into bed. “Buenas noches,” I say to her. 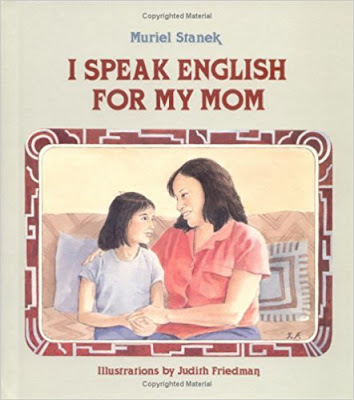 I Speak English for My Mom tells of a warm and loving relationship between a mother and her daughter, living and working in a mixed community in which everyone knows each other. It’s an older book, but still a refreshing addition to a body of literature that portrays the important roles that children in immigrant families—and particularly, in Raza families—assume. I Speak English for My Mom is highly recommended.